Hypothyroidism is a medical condition characterized by the inability of the thyroid gland to meet the body’s requirements of thyroid hormones. It basically means having an underactive thyroid gland. Because of the deep implications hormonal imbalances have on our health in general, disorders affecting the endocrine system such hypothyroidism or hyperthyroidism require immediate medical attention. What is the thyroid gland, where is it located and what does it look like? The thyroid is a small hormone-producing organ of the endocrine system, located in the anterior part of the throat, in front of the larynx and trachea. It is made of two lobes connected by a portion of tissue in the middle and looks like a butterfly. Differences in the appearance of the organ may arise, with a small portion of the population having a third lobe. The thyroid gland may vary in size from person to person and weighs about 25 g in an average adult. Women have been shown to have a slightly bigger thyroid than men. What does the thyroid gland do? The thyroid is an endocrine organ, meaning an organ that secretes hormones. But unlike other hormone-producing sources in our body, it secretes hormones directly into our bloodstream (just like the pancreas, the adrenal glands, the pituitary gland, the hypothalamus or the parathyroid glands). What are the functions of the thyroid gland? What the thyroid does is produce hormones that regulate metabolism, cardiovascular activity and sleep, support normal growth and development and reproductive system health and impact cognition. 1) Iodine deficiency. Our thyroid works on iodine. It needs the element to produce sufficient hormones. When we don’t meet our daily intake of iodine, we become deficient and our thyroid has to work harder to produce more hormones (often resulting in it increasing in size and causing goiter). But because it lacks the raw material for it, it cannot meet the body’s demands and hypothyroidism develops. 2) Autoimmune disorders. In autoimmune disorders, the body does not recognize and attacks various parts of itself. Different cells, tissues or organs may be the aim of its attack. The thyroid too may be subjected to an autoimmune response. Hashimoto’s thyroiditis is an autoimmune condition in which the body attacks the thyroid with lymphocytes (a type of white blood cell), seeking to destroy it. Inflammation of the thyroid, hypothyroidism, goiter and other symptoms are common consequences of the condition, but the diagnosis is confirmed by the presence of anti-thyroid antibodies in the blood (a sign the immune system is indeed attacking the thyroid). Because autoimmune disorders have been observed to be genetically inherited, having a primary relative with Hashimoto’s thyroiditis may indicate you may also be at risk of developing hypothyroidism or the condition at some point in your life. The condition is also believed to increase the risk of other autoimmune disorders such as celiac disease, vitiligo, alopecia or type 1 diabetes as well as the risk for thyroid cancer (this is a rare occurrence). 3) Thyroiditis. Inflammation of the thyroid gland, for whatever reason, can negatively impact thyroid function and have the organ produce insufficient hormones, causing hypothyroidism. In Hashimoto’s thyroiditis, the immune system attacks the thyroid with antibodies, producing damage and inflammation. Injury to the thyroid can also result in inflammation and underactivity. 4) Pregnancy. After delivery, the immune system bounces back to normal (pregnancy suppresses it slightly to prevent fetus rejection). This may lead to an increase in thyroid antibodies in already predisposed individuals. This increase can cause inflammation of the thyroid which may lead to hypothyroidism, or hyperthyroidism followed by hypothyroidism. The condition may resolve shortly or may become permanent and is known as post-partum hypothyroidism. 5) Congential causes. Congenital hypothyroidism occurs when children are born with an underactive thyroid. The condition can usually be resolved with adequate medical treatment. If left untreated, it leads to a form of extremely severe physical and mental retardation known as cretinism. 6) Surgical removal of the thyroid. Thyroid cancer, thyroid nodules may require the partial or total removal of the thyroid gland. It is possible for a remaining portion of the organ to satisfy the body’s requirements of the hormone, but both a partial and a total removal can cause underactivity. 7) Radiation is a treatment often recommended for overactive thyroid but can result in damage to the thyroid gland that can be serious enough to cause it to produce too little hormone and become underactive. 8) Problems with the pituitary gland or hypothalamus. The pituitary gland is responsible for secreting a hormone that stimulates the thyroid to produce its own hormones. A dysfunction of the pituitary glan can result in an underactive thyroid. Problems with the hypothalamus may affect the pituitary gland which further affects the thyroid. 9) Certain medicines. Several heart disease and cancer medication or medicines used to treat mental illness can alter normal thyroid hormone production and lead to underactivity of the organ. 10) Other. Disease of an infiltrative nature in which various cells or elements infiltrate in the thyroid can cause dysfunctions and underactivity of the organ. 1) Unexplained fatigue, feeling sleepy all the time. 2) Cold sensitivity (cold hands and feet). 3) Dry, rough skin, dry and thinning hair and hair loss. 4) Forgetfulness and difficulty concentrating. 5) Tendency to feel depressed. 7) Inexplicable and visible weight gain. 8) Difficulty losing the weight. 12) Goiter (when the thyroid swells). In babies, jaundice, abdominal swelling, impaired growth, constipation, cold hands and feet and lack of appetite are telling symptoms. Generally, except for goiter, symptoms are non specific and can be attributed to a variety of other medical conditions. This is why it is necessary to have your doctor perform blood tests to determine the levels of thyroid-stimulating hormone and thyroxine in the blood or the presence of abnormal levels of thyroid antibodies. If gone undiagnosed and untreated, hypothyroidism can result in health complications and may even build up to coma (known as myxedema coma) and death. Pregnancy hypothyroidism can lead to miscarriage, preeclampsia, diabetes or premature labor. Babies born from mothers with an underactive thyroid will also display telling symptoms of the condition and develop cretinism (severe physical and mental retardation) if untreated. What is the treatment for hypothyroidism? The condition can be prevented and treated, but treatment if often necessary for life for most sufferers. 1) Iodized salt and iodine-rich foods. Iodine is added to table salt to ensure the body is getting enough of the nutrient in order to stimulate a sufficient production of thyroid hormone. This is a prevention method. Including iodine-rich foods in our diet is also helpful. 2) Selenium. Research has revealed that the thyroid gland normally contains significant amounts of the dietary mineral selenium, proportionally more than other organs in the body. Moreover, the nutrient is directly involved in thyroid hormone production and has been found to decrease thyroid antibody levels in individuals with hypothyroidism of an autoimmune nature. Making sure we eat enough selenium-rich foods can help prevent the condition, while supplementation may help reduce the severity and improve symptoms, as well as reduce the risks of the condition becoming permanent, such as in post-partum hypothyroidism (Selenium and the thyroid gland: more good news for clinicians). 3) Synthetic thyroxine. 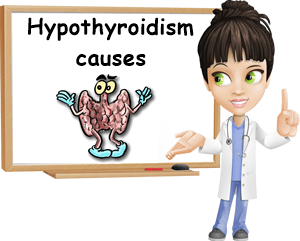 For most cases of hypothyroidism, a synthetic form of thyroxine (one of the principal thyroid hormones) is given to help meet the body’s demands and regulate metabolism. For most sufferers, this hormone replacement treatment is permanent. The only downside of the treatment is that it is often difficult to adjust doses perfectly. Too much of it can cause hyperthyroidism, while too little does not fully treat the underactivity of the organ. This makes it important to have follow-ups with your doctor to see whether or not the treatment is successful in bringing thyroid hormone levels within normal range. Any new symptoms, changes in current state of health or concerns should be reported to your doctor.